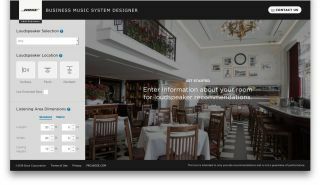 The What: Bose Professional has launched the Business Music System Designer (BMSD), a new online interactive design tool to aid audio integrators in specifying the right Bose Professional sound products in commercial audio applications. The What Else: The first release of this easy-to-use web tool focuses on Bose FreeSpace and EdgeMax loudspeaker recommendations for non-technical users, based on simple parameters such as room dimensions, mounting style, desired coverage and volume level. The tool then provides “good” and “better” options for loudspeaker quantity, tap settings, placement locations and spacing. The Bottom Line: The web tool’s intuitive visual user experience and reporting capabilities enable integrators to turn estimates around quickly, while helping to build credibility and more productive engagements with their customers.